Please refer to our stock # Ohara142 when inquiring. Two seated and three plowers in flight near the seaside, a full moon above. Paper size: Approximately 5.0 x 3.25 inches. 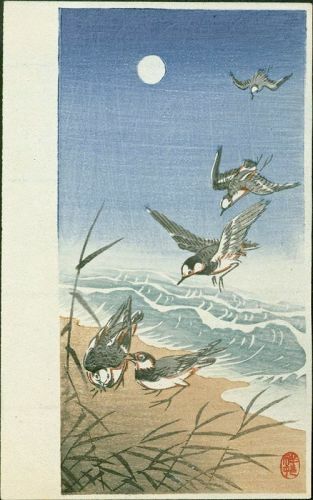 Reference: S22.2 in Crows, Cranes and Camellias: The Natural World of Ohara Koson (Reigle Newland).